Home » History » 1941 Nature Guide! We were delighted and amazed to find a copy of the 1941 Nature Guide to Glen Providence Park in the Media Historic Archives, after reading about it in the June 7, 1941 Chester Times. It was wonderful on a cool, blustery, beautiful day last Saturday to walk the trail described in the guide, comparing plants and features from 1941 and now! Along the way we referred to early park photographs and descriptions, while searching for ephemeral spring flowers. The 1941 Glen Providence Park Supervisor James Stokes wrote, “This guide has been prepared as a seeing eye for nature lovers, in order that they may enjoy the abundance of shrubs, flowers, trees and wild life found in this lovely Glen.” There are quotes from the Delaware County Park and Recreation Board President Samuel L. Smedley, and National Recreation Association Specialist L.H. Weir. 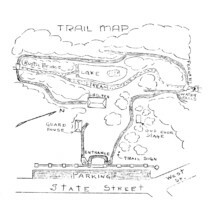 The self-guided 1941 trail starts by the main entrance on State Street, heading down the sledding hill past the concert stage and turning right along the Ice House Trail towards the Broomall’s Dam waterfall. Some of the still-existing trees and plants described include Flowering Dogwood, Hemlock, large Sassafras trees, Birch, Skunk Cabbage and Iron wood (Hornbeam). In 1941, we could have crossed “an arched rustic bridge which commands a beautiful view of the Falls”, to pass a fernery and get to the drinking spring by Broomall’s Dam. As that bridge fell long ago, we made a stream crossing over the stepping stones, past a scenic view of the wetlands fed by the numerous natural springs along Broomall’s Run. We made our way near the drinking spring, and saw the emerging Bloodroot flowers along the trail where indicated by the 1941 Guide. We first spotted the Bloodroot on April 3 this year during this cold spring, 17 days later than last year’s warm spring! In the absence of the footbridge, we made another stream crossing and connected with the lower Mountain Laurel Trail, abundant with the state flower Mountain Laurel, and an enchanting patch of Partridge Berry on a fallen tree. The 1941 trail ends at the pavilion, near our Earth Day Plantings. While it was a late-blooming Spring, it was beautiful to get a clear view of the park’s landscape with early Spring colors, before the foliage emerges. Thank you to the 14 adults, 2 lovely children and the delightful dog who joined us on our walk! You can view the PDF version of the 1941 Nature Guide to Glen Providence Park, and you can view and print our Annotated Trail Map with trail names and historical annotations!